Yes, it’s true, I have researched a house where a skeleton was uncovered in an old priest hole! Certainly, one of the most unusual stories I’ve heard in researching the history of houses! I was recently asked by a journalist to tell her the story of priest holes and secret tunnels found in houses. It is a fascinating element in the history of some 16th and 17th century houses when the need for hiding or a quick escape from authorities was a genuine consideration in house design. In speaking to the journalist, I recalled a house I researched in the past which involved the discovery of an old priest hole – and the priest was still in it! The story was mentioned in the article – read it here in The Sun – but it inspired me to write more of the story in a new blog post! Sadly, I’m not able to divulge the name and location of the house, but it is situated in a small village in Wiltshire and has been dated back to the early 1600s, at the end of the reign of Queen Elizabeth I and when James I came to the throne. By this time, the conflict between Protestants and Catholics had been a fact of life in England for almost 70 years, from the time of Henry VIII, accelerating during the reign of his children, Edward VI and ‘Bloody’ Mary. During the reign of Queen Elizabeth I, the persecution of Catholics was extreme and practicing the Catholic rites or holding Mass was seen as an act treason and resulted in imprisonment, torture, and in some cases death. It was these extreme circumstances that provoked the creation of priest holes. 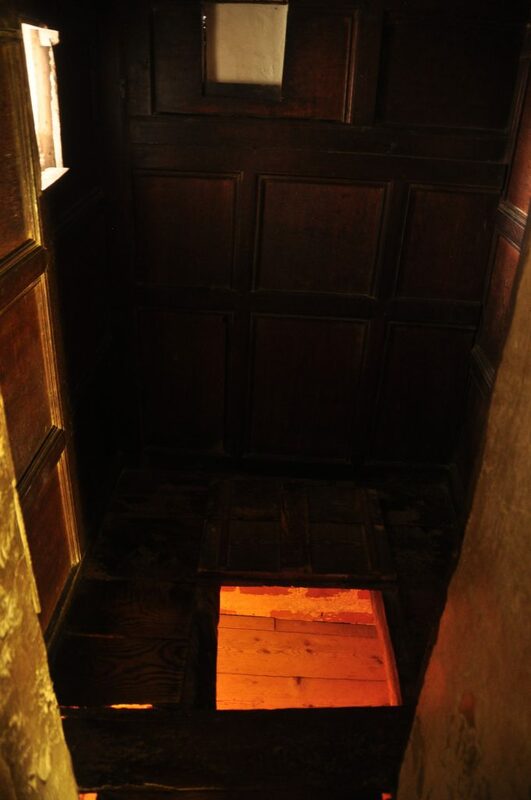 Priest holes were built in many places within a house – under staircases, behind fireplaces, between walls, under floorboards – anywhere where there was enough space to create a secret hiding place for a priest. There were several Catholic plots to assassinate the queen, so the need to hunt down and quash any catholic support was much bigger than just a personal choice of worship – not to mention the threats from Catholic Spain and rebellions with the support from the Pope in Rome. ‘Priest-hunters’ might suddenly appear on the doorstep and a quick hiding place was a matter of life or death! However, one of the most serious problems with priest holes was the lack of space, but also the lack or air or access to food or a place to go to the toilet. So, hiding in a priest hole could be just as dangerous if forced to remain there for an extended period of time. This is clearly what happened in the case of the Wiltshire house where the priest was still hiding in the priest hole 300 years later! The story of the poor priest was passed on from the former owner and a little more investigation would be necessary to uncover the full story of what happened, but it all started when former owners began renovations on the house in the late 1940s. The Grade II listed house was first constructed in the early 17th century and features exposed timbers with brick infilling, but it has also been altered several times, particularly during the 19th and 20th centuries. The first family connected to the house were recorded with Catholic connections, and given the date of construction, it seems likely it was constructed with a priest hole, or one was added soon after. This is understood further when considering the date of another Catholic plot against the reigning monarch, this time James I, with the Gunpowder Plot in November 1605. 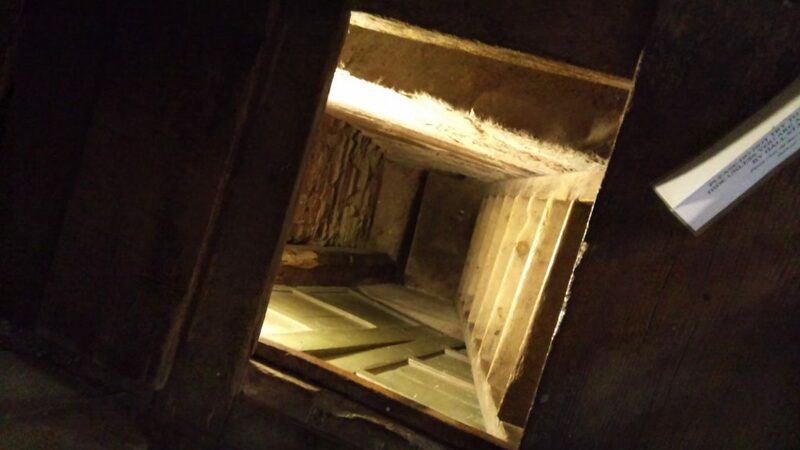 Despite an understanding of the times and the need for a priest hole in the house, the true story of how a priest came to be stuck in the priest hole for 300 years is a bit of a mystery. One speculation is that the family had time to hide the priest away, but they were arrested and there was no way of getting back to the house to release the priest. Whatever the circumstances, it was over 300 years later, in the late 1940s when new owners were renovating the house that they pulled away a internal panel to find the hidden priest hole and the skeleton of the priest – what a discovery! The gruesome discovery is certainly unusual, but once again it reveals the extraordinary stories that can be found in researching the history of a house.